Are YOU Ready for Oprah's New Starbucks Line of Chai Tea? Looks like Oprah's getting into the overpriced beverage business! 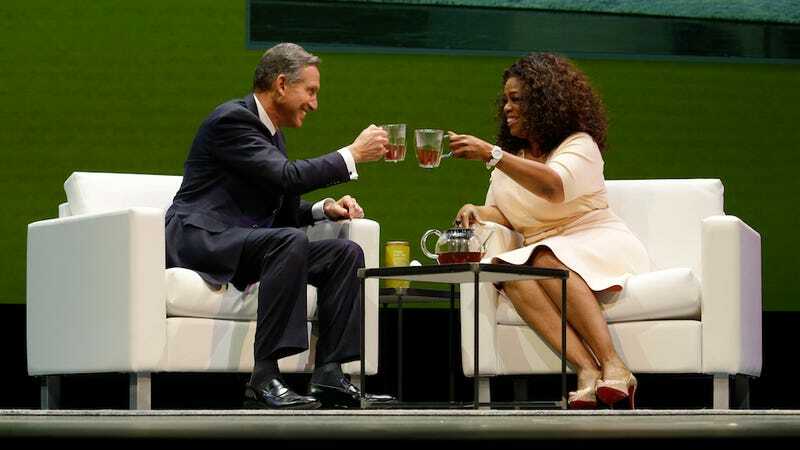 The TV/magazine/everything ever tycoon has partnered up with Starbucks for their new Teavana Oprah Chai Tea collection, on sale at the end of April. "Starbucks is not just a coffee company… it's about nurturing the human spirit. What my goal in life has been, what I suppose my brand has become, is nurturing the human spirit." This sounds really nice and adding charity to the partnership always seems to sweeten the deal, but come on. Given the skyrocketing price of coffee, Starbucks probably has no choice but to "rebrand" tea and "elevate the tea experience." Besides, we all know where this "rebranding" thing is going: vintage colonial-chic tea box sets as an homage to East Tea Company. You know, to remember the good ol' colonial tea-drinking days.